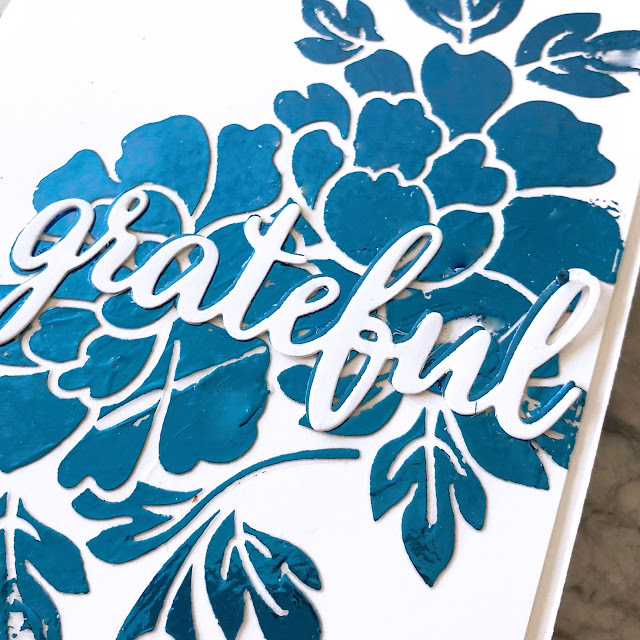 Stencilling is another great way to get the most out of your foils on your cards! The Transfer Gel by Therm O Web makes it all possible! Lay down your stencil, spread the gel, let dry and foil! Super easy and fun. It's just a matter of spreading the gel like butter on a sandwich! 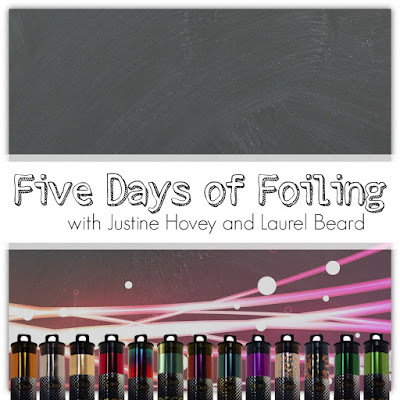 Don't forget this Five Days of Foiling series is a collaboration with the fabulous Laurel Beard, be sure you check out her video and blog! This Floral Stencil is something that I reach for over and over again. I just love it! Paired with some Denim foil, it is very regal looking. I find the more larger areas I have to cover with the gel, the chances of me not getting even coverage are greater resulting in spots that are missing foil. I kind of love it though! The Marching Leaves Stencil is another favourite of mine and is now available outside the original Stamp of Approval collection. 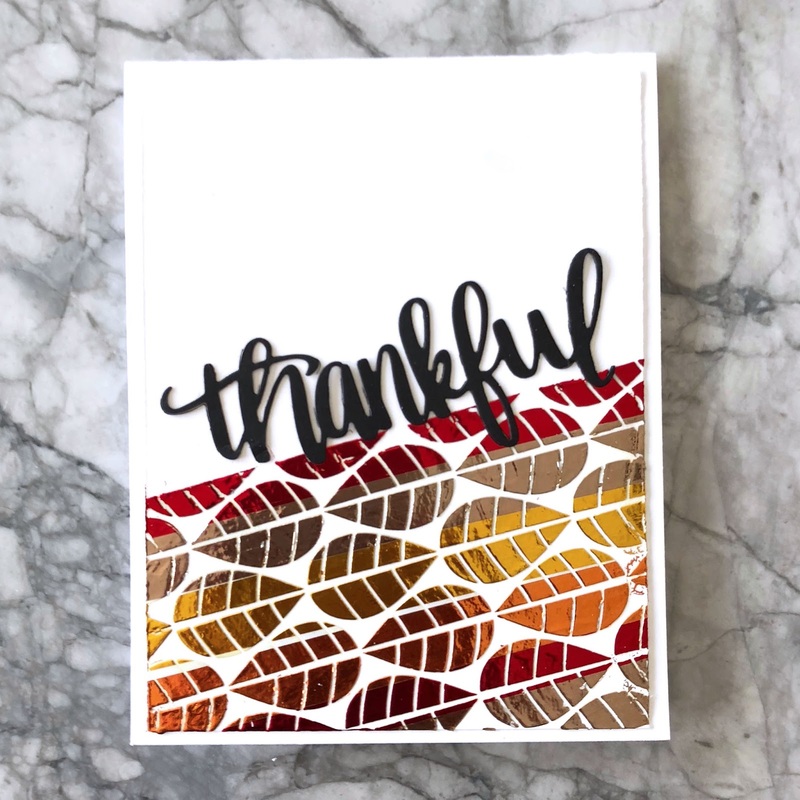 I cut little strips of foil and layered them next to each other to create a pretty fall card. I realize it's a bit out of season but I love this anyway! 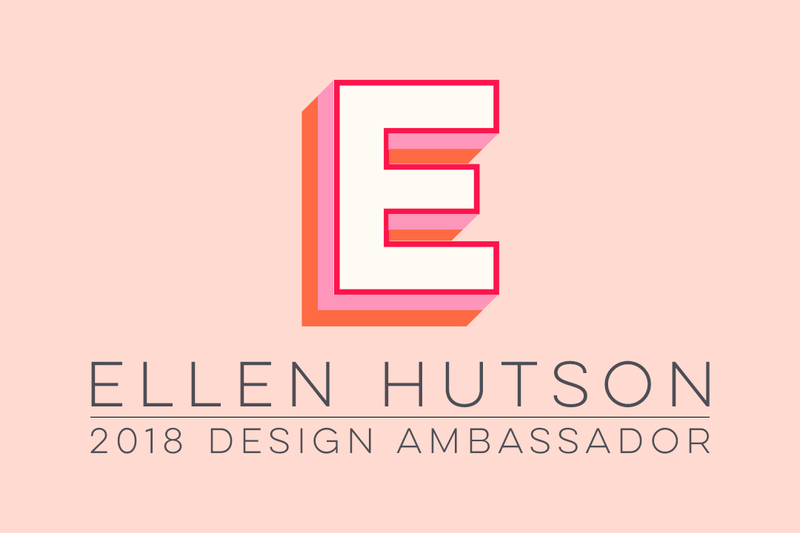 I can't wait for Day 3! We are going to be foiling some clear sheets of acetate! Wow - how pretty! I might have to invest in some transfer gel. Both are beautiful cards. Oooh, I can't wait to see this done on acetate! 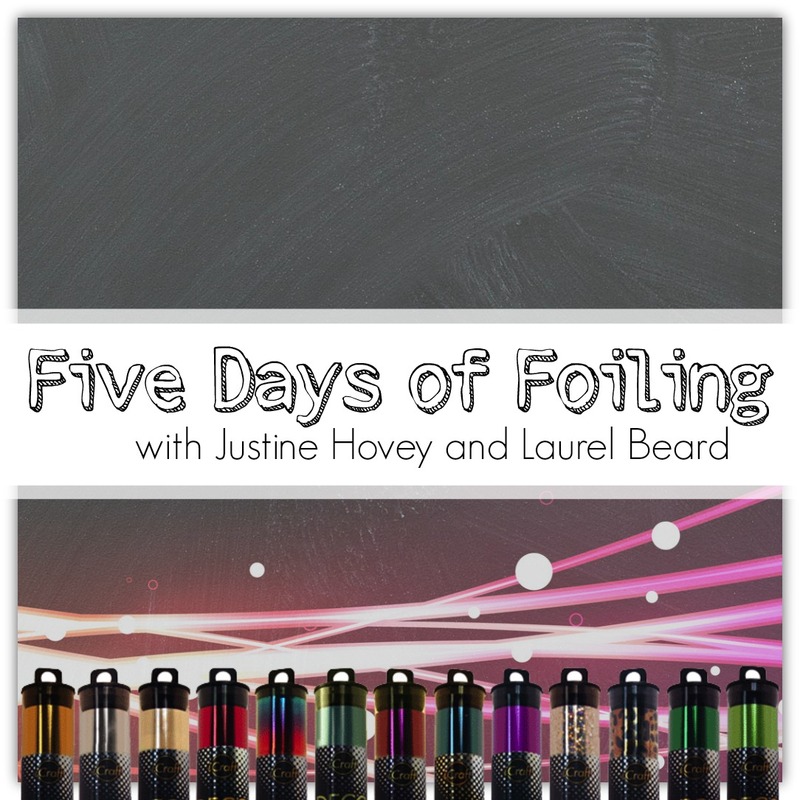 You and Laurel are doing a great job in showcasing foiling. I like what you are creating. Thanks for showing cards that are not perfect in the foiling category. Wonderful techniques. Thanks for sharing . 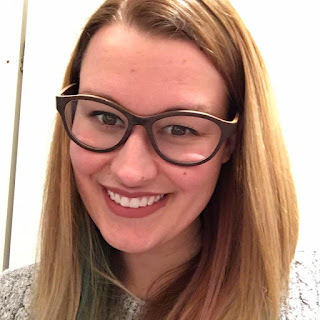 Enjoying the videos that both you and Laurel are doing. Thanks for sharing. I love your videos. That blue foil is gorgeous! Thanks for reminding me about the different ways to use foil. Love the cards. I am so happy you are focusing on foil. I love the shine and color. Your autumn leaves card is just beautiful! Love all the ideas you and Laurel are sharing for using all the pretty foils I have been buying! Very pretty. Those leaves were gorgeous. Anxious to see tomorrows video, Can only imagine what foil on acetate will be like. beautiful cards - that transfer gel looks like so much fun to use! Love the multicolored foil card! So pretty!!! After watching the first two videos in the series I jumped into my crafty stash and dug out my foiling supplies. I found an old laminator in my husband's office, plugged it in and made sure it worked. Since it's supposed to rain for the next several days I'm going to be foiling like a mad person! 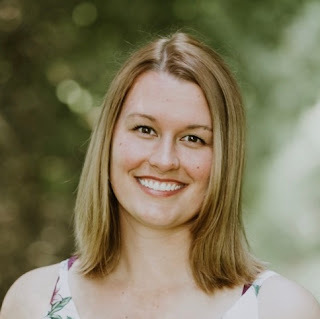 Thanks for the inspiration and for sharing! Beautiful! And I don't think that thankful card is out of season at all. It's always in season to be thankful!! I am enjoying the foiling tips and tutorials and looking forward to learning more techniques. Those leaves look so cool! Thanks for all the tips. Stunning cards! I love the contrast of the flat white paper and the shiny blue foil. The leaves are fantastic in warm autumnal colors and shine. Love the fall-themed card. Definitely was worth the extra time it took - gorgeous card. Can't wait to try this technique. Beautiful cards. I enjoyed your video.